"Aardbeving" is composed of "aard" – from "aarde" – and "beving", which respectively translate to "earth" and "tremor/shake". – "Japan is vanmorgen getroffen door een zware aardbeving." – "De aardbeving heeft een grote tsunami veroorzaakt, de situatie is nu zeer ernstig." – "Tijdens de aardbeving in Christchurch zijn er meer dan honderd slachtoffers gevallen…" – "Verschrikkelijk!" – "Ik sta op mijn benen te trillen": my legs are shaking. Lit. : "I'm shaking on my legs". – "Beven van (de) angst": to tremble with fear. – "De kinderen beefden van angst toen de bullebak tegen hen schreeuwde." – Aarde: earth, dirt, ground [noun] [de aarde, de aardes]. – Beven: to tremor, to tremble, to shake [verb] [beven, beefde, h. gebeefd]. – Trillen: to tremor, to tremble, to shake [verb] [trillen, trilde, h. getrild]. – Trilling: tremor, vibration [noun] [de trilling, de trillingen]. – "Voel je die trillingen in de tafel? Het zal toch geen aardbeving zijn?" – Schaal van Richter: Richter scale. 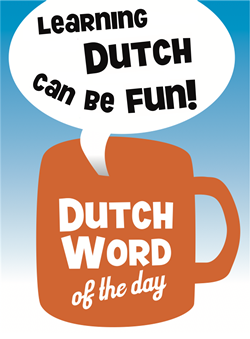 This entry was posted in Dutch word of the day, DWOTD 1.0, Vocabulary Basic and tagged aardbeving, aarde, beven by Marc. Bookmark the permalink. Is the word “bever” derived from “beven”? This is where DWOTD is so useful, Dutch Gurus. Finding and using the right verb is always “iffy” for me as an “allochtoon”. If I saw “getroffen” without a translation, I might revert to my German heritage and immediately think of meeting, but then of course I know that’s “ontmoeten”. And so all sorts of confusion would ensue. But happily not now with these examples. Thanks again for the wonderful work! @Amy, the animals “bever” and “beer” (E., “beaver” and “bear”) are believed to share etymological roots going back to the reconstructed Proto-Indo-European root *bher/*bhru, which meant reddish-brown. In the case of bever, the root is reduplicated, and you see this in other languages: Czech bobr, German Biber, Lithuanian bebras, Latin fiber (also, castor), etc. In contrast, the word “beven” (G., “beben”; E. “tremble”) goes back to a PIE root *bhoyǝ- with a meaning along the lines of “to be afraid, to frighten”. @Chris – as a matter of fact “getroffen” can also be used in the meaning of “meeting”. The verb would be “treffen”, but is used for “meeting up” whereas “ontmoeten” is more often used for “the first unplanned encounter”. However, you are more likely to hear the verb “afspreken” used for “to meet up”.